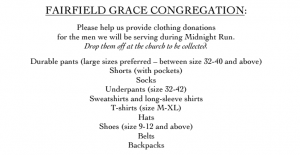 Each spring, our Fairfield Grace Youth Group holds a collection drive for clothing and toiletries. We sort and label all donations and bring them, along with a hot meal and packed lunch, to the homeless in New York City late at night through the organization Midnight Run. Join us to help prepare sandwich lunches for the homeless that we will be taking with us that night into New York City on Saturday, April 23rd from 5:00-8:00 PM at Fairfield Grace. This is a great service opportunity! Dinner will be served. Please RSVP here so that we know how much dinner to prepare (it only takes 1 minute! ): Middle School Meeting RSVP – April. Join us on our Midnight Run overnight event on Saturday, April 23rd. You must be dropped off at Fairfield Grace at 5:00 PM on Saturday and picked up at approximately 2:00 AM the next morning on Sunday, April 24th when we return. Dinner will be served. You (or a parent/guardian or any students under 18) must complete the permission form here to attend: High School/Young Adult Permission Form – Midnight Run 2016. All are welcome to join us from 5:00-8:00 PM on Saturday, April 23rd to help us in our preparation and departure! Special thanks to the Susannas of Fairfield Grace for making the toiletry kits for us to bring with us to distribute. 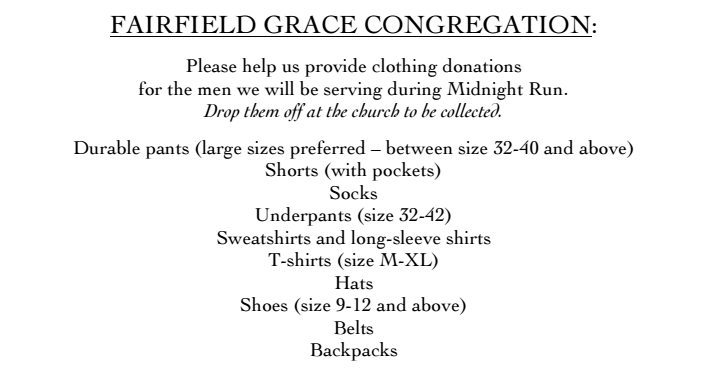 If you have any questions about Midnight Run, please email Sue Rush at rushsusan@sbcglobal.net or Matt Rush at mrush224@gmail.com.